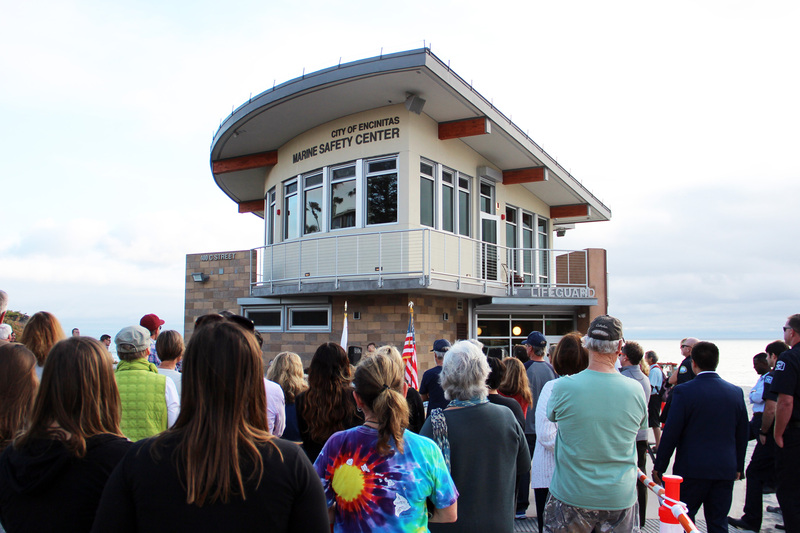 6/3/18: Our Moonlight Beach Safety Center Officially Opens! 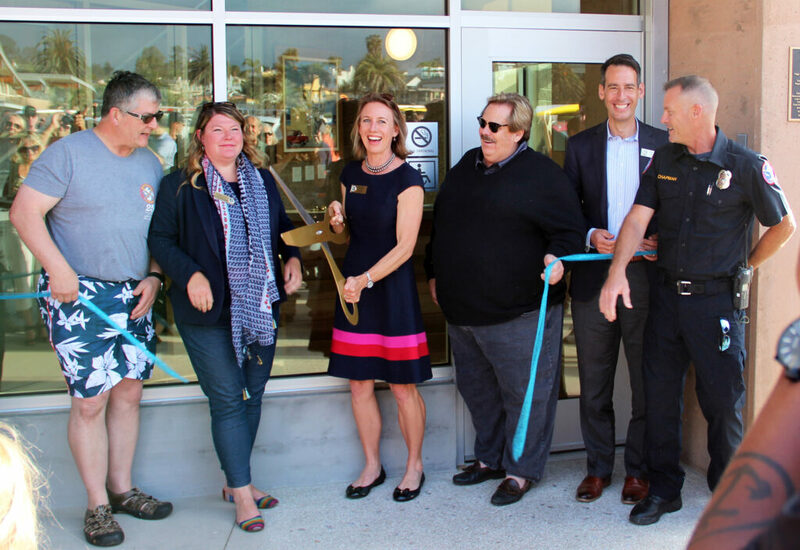 This week we had the privilege of dedicating Encinitas’ brand new Moonlight Beach Safety Center, one of our larger capital projects in recent years. Moonlight Beach attracts more than a million visitors a year, and our city’s lifeguards respond to 3,600 medical situations yearly, including injuries from surfboards, reefs, stingrays, and bees. Seen above, the $3.9 million safety center replaced our aging 60-year-old lifeguard tower that suffered from multiple structural problems and was functionally limited by its small size. 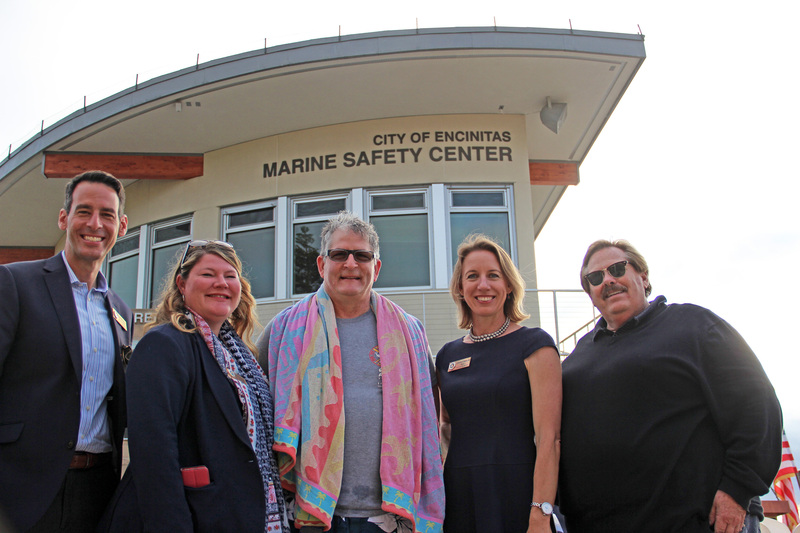 In the lower ribbon-cutting photo, it’s a toss-up as to who was more appropriately dressed for the occasion, Councilmember Tony Kranz at left, who took an ocean dip right after this photo, or the rest of us! The new 2,350-square-foot facility was designed to provide much improved public safety, including a first aid room with direct ambulance access, lifeguard lockers and showers, a secured desk for sheriff’s deputies to coordinate mutual aid with other agencies, and ample equipment storage areas. In keeping with Encinitas’ cutting-edge environmental policies, the design also allows for the bottom floor to flood in case of king tides and sea-level rise. There’s also an area for sea lions and other ocean animals to be protected as part of rescue programs. Beyond our current City Council, staff and lifeguards, credit for this exceptional structure goes to the energies and vision of many, including our former City Council colleagues Teresa Barth and Lisa Shaffer. I was proud and delighted to join the large crowd of people who were there to celebrate and explore our state-of-the-art building after the official ribbon-cutting dedication. You can see more photos of the event at the end of this newsletter. The city recently hosted an informational meeting about the pedestrian railroad undercrossing at or near Verdi Ave. in Cardiff. You may have seen the tremendous construction in the rail corridor right now. In addition to a new concrete drainage culvert, and double tracking on the south side, the rail trail is currently being built on the north end near the connection with the pedestrian underpass at Santa Fe Drive. Here’s more information on the community meeting about the Verdi undercrossing from the Coast News. Hats off to creative commissioners who come up with innovative ideas for Encinitas that are practical and workable in our city’s context. Here’s a San Diego Union-Tribune story about a proposed “Cyclovia,” an event where a street is shut down to cars for a short period, then opened for exclusive use by cyclists, skateboarders, rollerbladers, scooterers and anyone else without a car. By holding the event a few hours before our annual Holiday Parade, the proposal from Traffic & Public Safety Commissioner Brian Grover takes advantage of the existing road closure to reduce the inconvenience to motorists. 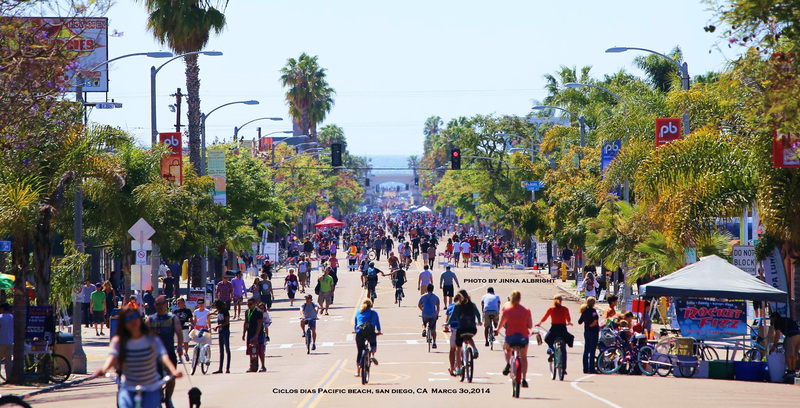 The photo above shows an open streets event in Pacific Beach from 2014. It’s a fun idea that I hope we can make happen in Encinitas! 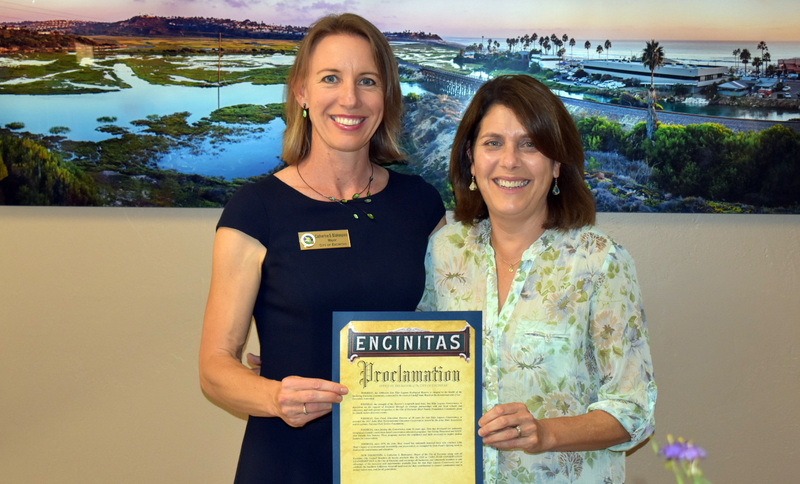 I was honored to present a proclamation to San Elijo Lagoon Conservancy Education Director Tara Fuad, celebrating Tara Fuad Conservation Leadership Day. Tara received the 2017 John Muir Environmental Education Conservation Award, and the cities of Encinitas, Escondido and County District III each dedicated a day to recognize her. Here’s an Encinitas Advocate story about the San Elijo Lagoon Restoration project. If you’ve recently driven by it or explored on foot, you’ve probably noticed that our lagoon is undergoing major rehabilitation. The benefits to lagoon health will become clear after construction ends. 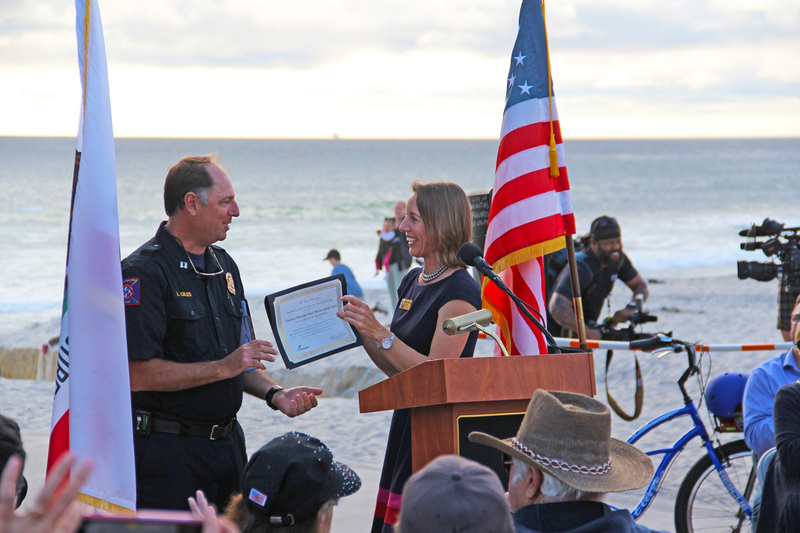 If you know an exceptional environmental leader, consider nominating them for the Encinitas Environmental Award Program, which will be presented at the Surfing Madonna Beach Run in October. You can nominate someone online here until September 7. The Coast News article is here. Dont forget to vote this Tuesday! Please vote in the primary by this Tuesday, June 5th, only two days away! Major decisions are made by the people who sit at the table where decisions are made. Make sure the table is filled with those who support your values and your perspective. Because it’s a “jungle primary,” the top two candidates – regardless of political party – make it through to the general election. Critical choices that will affect our future are being made in this election. About 7,000 Encinitas residents have mail ballots they haven’t returned yet. It’s better to return them early by dropping them at the Encinitas Library or another location (drop sites listed here) because they can be prepared for immediate counting on election night, reducing the deluge on election day. You can still get an “I Voted” sticker when you return your ballot at the library or other location, so don’t let that stop you. Another benefit is the mailers, texts and phone calls will stop once you’ve returned your ballot. One candidate I support without reservation is Tasha Boerner Horvath for Assembly District 76. She’s running to represent Encinitas and other communities in the state Assembly, a seat currently held by Rocky Chavez. I have first-hand experience of Tasha’s passion, intelligence, command of the issues, and boundless energy. She’ll do a great job for us at the state. Your five local elected officials enjoying the festivities – (from left) Deputy Mayor Joe Mosca, Councilmember Tasha Boerner Horvath, beach-ready Councilmember Tony Kranz, me, and Councilmember Mark Muir. This spectacular new Surfing Madonna Oceans Project mosaic, “The Pacific Playground,” adorns our new Marine Safety building. 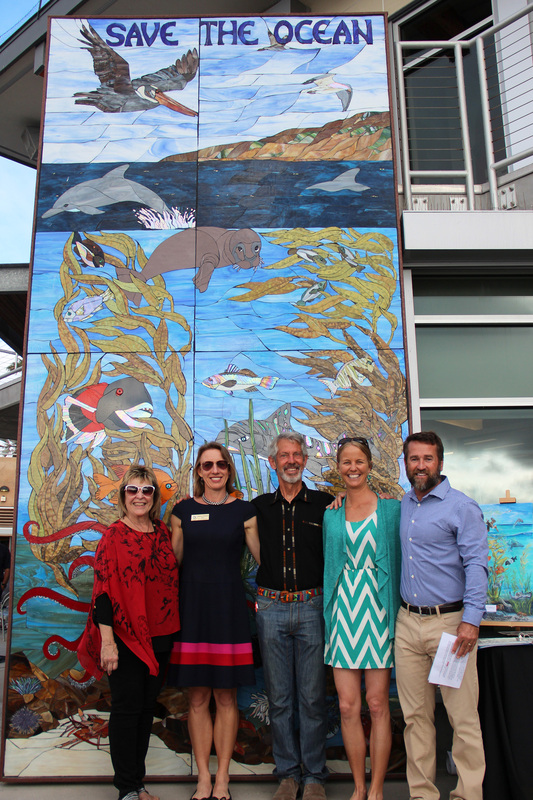 Thank you to the mural artist Peggy Sue Zepeda (on left), the original Surfing Madonna artist Mark Patterson (third from left), and Megan and Bob Nichols (on the right) who spearheaded, created, organized and funded this perfect addition to the new building. Presenting a certificate of appreciation to Marine Safety Captain Larry Giles at the Marine Safety Center dedication ceremony. Previous Post5/27/18: Encinitas’ Housing Plan: Necessary, and Almost ReadyNext Post6/10/18: Re-Elect Mayor Blakespear!